Cambodian opposition leader Sam Rainsy on Friday welcomed a Feb. 9 U.S. court decision to allow Chevron Corporation to be subpoenaed for security camera footage it may have of the murder in Cambodia last year of a popular political analyst. The video may prove government involvement in the shooting of political analyst and government critic Kem Ley in a gas station in the capital Phnom Penh, Cambodia National Rescue Party president Sam Rainsy wrote in a Feb. 10 posting on his Facebook page. “A North California District Court has granted the right to subpoena the U.S. company Chevron for video footage of the shooting of Dr. Kem Ley, who was killed on 10 July 2016 as he was drinking coffee at a Chevron (Caltex) service station in Phnom Penh,” Sam Rainsy wrote. Chevron has 30 days to contest the court’s ruling, Sam Rainsy added, citing court documents. 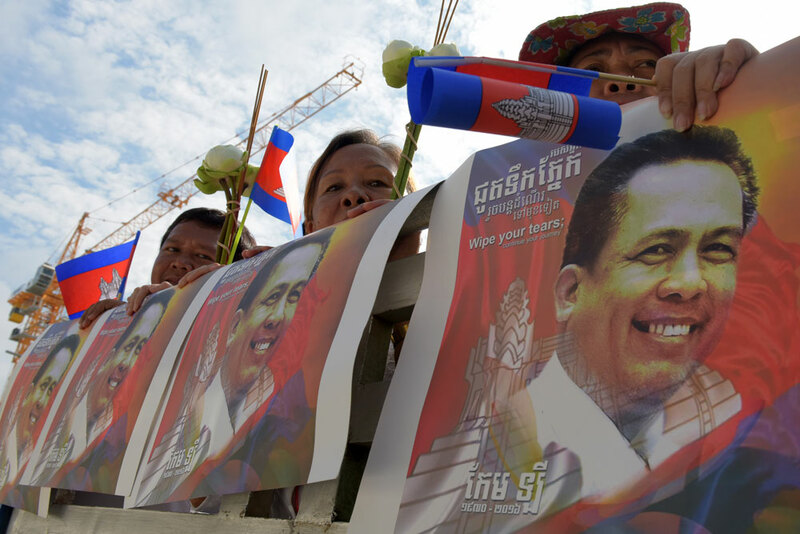 Just days before his death, Kem Ley had discussed on an RFA Khmer Service call-in show a report by London-based Global Witness detailing the extent of the wealth of Cambodian Prime Minister Hun Sen, who has ruled Cambodia for over 30 years, and his family. Following the shooting, Cambodian authorities arrested and charged a former soldier named Oueth Ang, who says he carried out the killing over an unpaid debt. Oueth Ang, the only suspect to be charged so far in the case, is now scheduled to go to trial in a Cambodian court on March 1. Many in Cambodia feel the investigation into Kem Ley’s death has been diverted from looking more deeply into who else may have been involved, though. “Not much progress has been made in this investigation,” a motorized rickshaw driver in Phnom Penh told RFA’s Khmer Service on Feb. 10. Also speaking to RFA, a student in the capital said that Kem Ley’s murder has now “been taken for granted” and that the murdered analyst and his family are being denied justice in the case. Reported by Moniroth Morm for RFA’s Khmer Service. Translated by Nareth Muong. Written in English by Richard Finney. in Camboda.I suggest that all new papers, radios, and others associations inside and outside of Cambodian should address to the United Nations to withdraw Hun Sen from the candidate of Prime Minister next term election 2017 because he has many suspect to be charged from many of cases, and other relationship with 11 millions illegal Vietnam to live in Cambodia. This is great news. Hun Sen has only the truth to fear. They will try anything to avoid the truth getting out- instead they focus on marital affairs, of which Hun Sen is also guilty, but for some reason uncharged. Even though one affair appeared to lead to - MURDER.